Cooking meals for my AdvoCare 24-Day Challenge calls for creativity in my kitchen. Eating nutritious food in moderation and adding daily supplements is a good thing. However, I like to eat, and I like food cooked southern style. If it doesn’t look and taste good, I’m not interested in eating it. Plus, it’s got to be filling and satisfying. Perhaps you aren’t familiar with southern-style cooking. Let me introduce you to it. My mother and grandmothers grew vegetable gardens. I was raised on fresh vegetables that were blanched and preserved by freezing them. My favorite that Mother always kept for me in the freezer was yellow summer squash. She would saute onions, chopped fine, in some butter and add a tablespoon of sugar, a little salt and pepper, and thinly-sliced squash and cook until the squash was tender. She would let it cool awhile then put it in a freezer bag and into the freezer. When I would come home for a visit, she’d pull out a bag of squash for dinner. Oh my. That was true comfort southern cooking from home. Some vegetables can taste a little bitter or tasteless like squash, Brussels sprouts, or peas. Adding a tablespoon of sugar is the trick to taking the bitter taste out. One tablespoon of sugar in a large pan of vegetables is not a lot of sugar. You may not be able to have even a taste of white sugar, or you may be one who absolutely stays away from sugar completely. That’s okay. You can come up with your own creative ways to make vegetables tasty. The good ole’ southern way works for me, however, and let me tell you – it tastes good! We have had lots of summer squash from the garden. I tried your “spoonful of sugar” tip. It was delicious. Southern food is delicious, but it’s not always good for you. 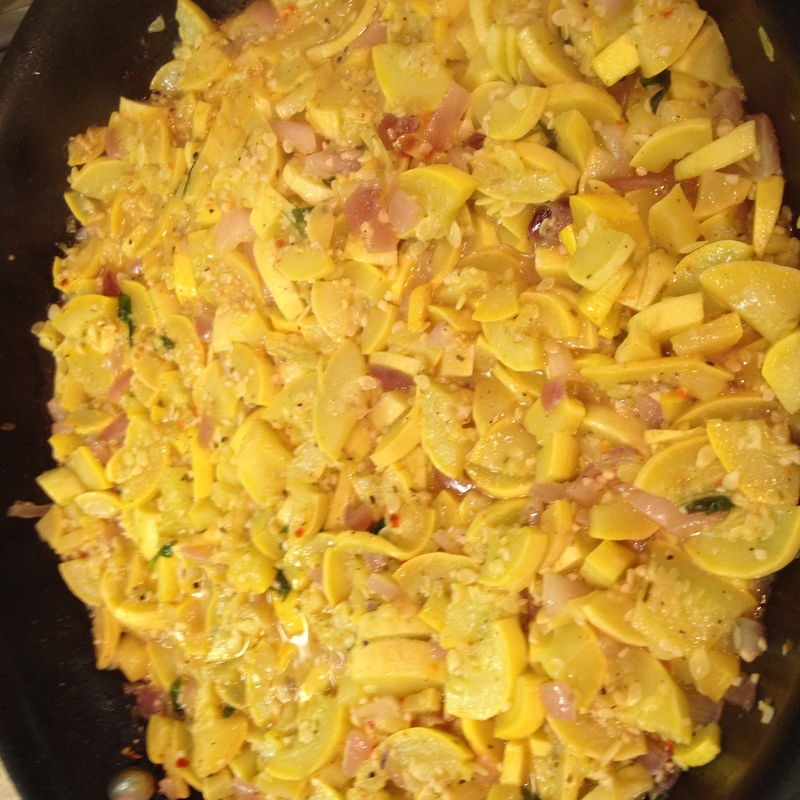 I love summer squash sauteed with onions and garlic in a bit of olive oil. My mom would add tomatoes,too.